I’m a big fan of San Diego’s Ballast Point—the brewery’s Sculpin IPA is fantastic—but after reading a description of Indra Kunindra, I decided to go with something else. The selection of great beer at these bars is impressive, and the fact that Indra Kunindra is made with both curry spice and cumin, neither of which I really like, was a major turnoff. It kind of just sounded too…weird. But when I returned to Boston, I found a 22-ounce bottle, and I decided to give it a go. I poured my Indra Kunindra into a frosted pint glass, and it immediately formed a frothy tan-brown head made of very fine bubbles. The head quickly dissipated, leaving a thin layer of carbonation atop the dark brown brew—it’s not quite black, but very deep brown. And the India-style export stout is thick, but maybe not quite as thick as the average stout. 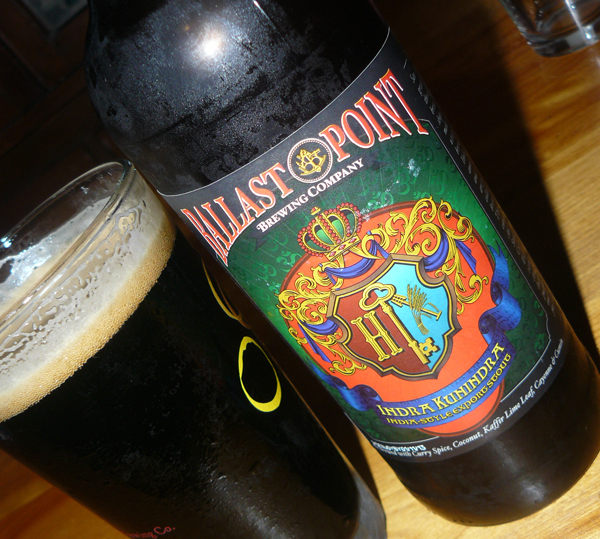 Ballast Point’s Indra Kunindra has a very mild aroma of spice, earth, coconut and sweet lime citrus. The stout is made with Madras curry spice, coconut, kaffir lime leaf, cayenne and cumin. But no one flavor is overpowering, and they all combine quite nicely. You can taste and smell the lime and coconut more than anything else. The cayenne pepper leaves you with a notably spicy aftertaste and lingering burn. Overall, I like this beer much more than I expected to after reading its description, and I regret not trying it on tap in San Diego. Award-winning home brewer and Ballast Point Senior Brewer Alex Tweet made the brew in honor of the 46th anniversary of San Diego’s Holiday Wine Cellar, with the goal of creating a truly unique beer that pushes the boundaries of home and craft brewing. And he admirably succeeded. My bottle cost $10.50, so it’s not exactly cheap. But I don’t feel as though that’s an unreasonable price for such a unique brew. It has an ABV of 7.0%. There’s no official Indra Kunindra page on Ballast Point’s website, unfortunately. 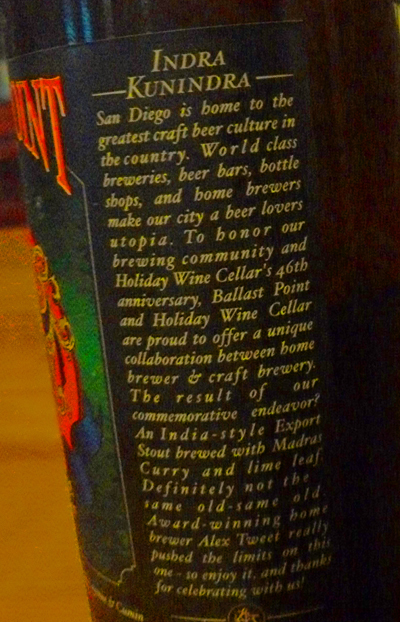 Ballast Point Brewing’s Indra Kunindra India-style export stout currently has a BeerAdvocate.com score of 86, based on 45 user ratings. And it gets a 7/10 ranking on the Urban Beer Nerd Scale. I had Indra Kunindra on tap at Stone Brewing in Escondido. I read the description and was at first was hesitant. I was very glad I tried it. Full of different flavors and aromas with a subtle lingering warmth from the cayenne pepper. A great beer to pair with food. I agree. Like I said in my post, I was kind of turned off after reading the beer’s ingredient list. But I was pleasantly surprised. Lots of complex flavors that come together nicely. I’ve never been to Stone’s brewery or brewpub, but I definitely want to. It’s on my list of things to do next time I make it to San Diego. Stone is a great beer (and food) adventure. I have been going there for years whenever I was in the area. Now both of my daughters attend college in the area and one of them works there. If your a beer snob (or nerd) like me, So Cal has a lot of great flavors to discover and enjoy.